Summer is a great time to go out for a ride with your horse. But it’s important to take care of your horse as they also feel the summer heat and can be prone to various health issues. Summers can make your horse feel dehydrated and can lose weight in abnormal capacities if they are not hydrated from time to time. Here are some tips to keep your horse safe and healthy during this exhausting summer. Summer heat can make your dog lose 3.5 kg of weight per hour if they are exposed to direct sunlight without providing any hydration. On an average, horses at least need 5 gallons of water per day to keep their body hydrated. Keep ample amount of water stocked with you if you are going on long rides. You can also add electrolytes to help increase the water consumption and replace losses from sweating after consulting with your vet. As electrolytes can worsen dehydration give your horse fresh water to drink after giving them electrolytes. If you are traveling in the exhausting summer heat at times your horse’s body temperature can rise up to 104°F. 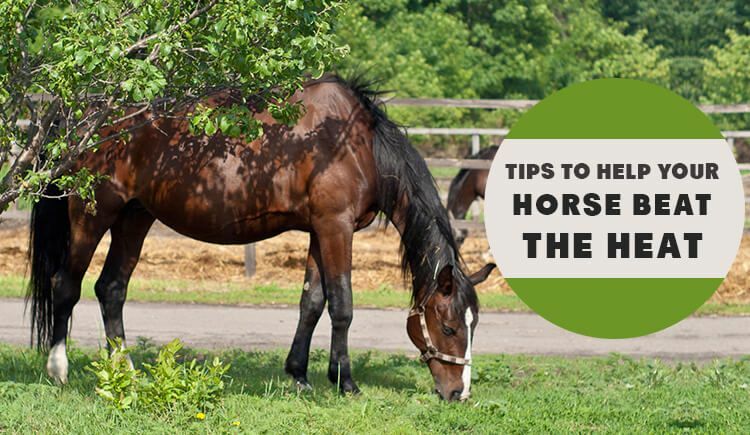 If you face such a situation immediately find a cool shade for your horse and douse him with cool water until his body temperature drops to 101°F or lower. This can also happen to your horse if he is obese, has poor fitness, or has a dark coat. You should practice warming-up your horse before going on long rides. In summer, your horse’s body can get warmed-up very quickly. You can reduce your horse’s warm-up time to half of what you generally do. After you are done with it keep your horse in a cool shade and provide him with fresh cool water. Helping your horse relax won’t affect the physical effects of warming-up. Summer is the time for taking part in shows and competitions. Remember, in summer your horse produces more adrenaline and uses more muscle energy as compared to cooler climates. Dehydration becomes a major problem in those situations. Avoid taking part in competitions in too hot weather conditions to avoid causing any heat-related disease to your horse. When you trailer your horse they have the habit of shifting body weight with your trailer motion. The energy utilized in this is almost equal to walking. Make sure you don’t trailer your horse for longer duration in the summer heat. You should also take care not to leave your trailer in direct exposure to sunlight for a long time. As trailering can affect your horse’s immune system and can cause “shipping fever” or in worst cases pneumonia. Summertime is a great time to travel with your horses and be a part of various parades, shows, and competitions. While you are enjoying the rides and competitions on your horse don’t forget to take necessary precautions to prevent your horse from getting sick.